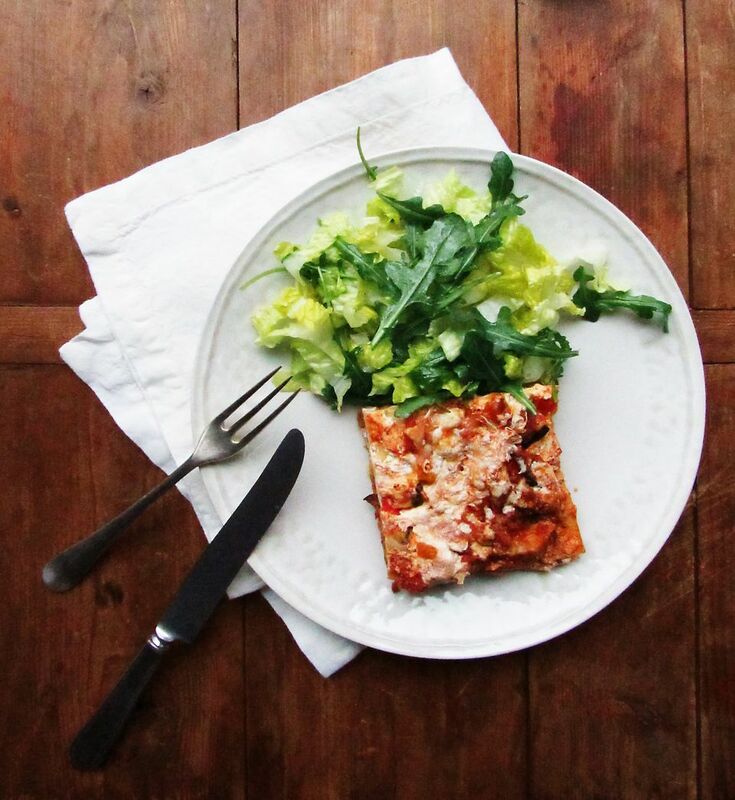 During the summer months when the produce is piled high at the farmers’ market, this is a great way to take advantage of all of those vegetables in a family-style lasagna. No-cook noodles are a fabulous shortcut ingredient, especially in the summer when you don't want to boil a pot of water. Speaking of shortcuts, a jar of store-bought spaghetti sauce gets you to lasagna faster. Leave out the sausage for a vegetarian version. Preheat the oven to 375 F. Preheat the grill to medium. Brush the eggplant, zucchini and peppers with the oil and season them with salt and pepper. Grill the vegetables for about 4 minutes on each side, until they are nicely marked and tender, and grill the sausage for about 10 minutes, turning it so that is cooks evenly. Cool the vegetables until you can roughly chop the vegetables, put them in a bowl, pour in the spaghetti sauce, and toss to combine. When the sausage is cool enough to handle, crumble it and stir it into the bowl with the vegetables and sauce. In a medium bowl, beat the eggs lightly. Add the ricotta, basil, oregano, 1/3 cup Parmesan cheese, and season with salt and pepper, and stir to blend. Spread all 6 of the lasagna noodles with even amount of the ricotta mixture. Place 2 noodles into the bottom of a 8 or 9-inch square baking pans, covering the bottom. Layer over 1/3 of the chopped vegetable mixture. Then evenly layer 1/2 cup of the mozzarella over the vegetable mixture. Repeat until you have three layers. Sprinkle the top of the lasagna evenly with the remaining Parmesan. Cover the lasagna with tin foil (see Cooking Tips). Bake for 25 minutes, then remove the foil and bake for another 20 to 25 minutes until the lasagna is bubbly and slightly browned on top. Let the lasagna sit for at least 10 to 15 minutes before cutting, so that the pieces hold together better. Grilling the vegetables up to 2 days ahead of time can make preparation much quicker. Add a pinch or red pepper flakes if you wanted a little kick. You could use a grill pan or make the vegetables on the stovetop if you don’t have access to a grill. Use spicy or sweet turkey sausage—your choice. Spray one side with nonstick cooking spray and place that side down on top of the lasagna—when you remove it, the cheese won’t stick to the foil! How Can You Make the Most of Cherry Season?